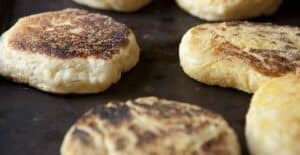 This is the absolute best recipe for Homemade English Muffins that gives you all of those delicious nooks and crannies! 1) Stir together the flour, sugar, salt, and yeast in a large bowl. Mix that all together and then stir in the butter. 2) Add in the buttermilk or milk to form a very loose dough. 3) Dip your hand in water and sort of using it like a dough hook to mix the ball of dough even more. After a minute or two of that, knead the dough until it passes the windowpane test, probably about 10 minutes. 4) Set this dough in a clean bowl that has been lightly oiled. Cover and let ferment at room temperature for 90 minutes. 5) Once the dough has fermented, cut it into six pieces. 6) Work with wet hands and take one piece of dough. Shape it into a round about 4 inches in diameter and place it on a baking sheet heavily dusted with cornmeal so the muffin can hold its shape. 7) Repeat until you have six muffins, dust them all heavily with cornmeal on top, cover them with a damp towel and let them rise for another 90 minutes. 8) Pre-heat the oven to 350 degrees. 9) Get out the largest pan or griddle your own and spray or wipe it with oil. Turn your stovetop on medium-high heat and get the pan hot. Spray some oil (or wipe some oil) in the pan. 10) When the pan is hot, put each muffin down without letting them touch. The dough will spread out and start to puff up. 11) Cook them on the first side for 5-6 minutes. When they are a medium brown, give them a flip. 12) Cook them 5 minutes on the other side and then transfer them immediately to a sheet pan in the pre-heated oven. 13) Cook them in the oven for 8-10 minutes. Then let them cool for at least 30 minutes. This delicious recipe was brought to you by Macheesmo. Read the full post at https://wp.me/pkSYO-9T7.